A summary of the Bicknell symposium is available on the School's web site. The actual video of the event will be made available soon. "The uncomfortable reality we face this morning is that this legislation is simply bad news," Basham said. He said the FDA was not up to the task of finding ways to "make an unsafe product safer." He also said that the process of "validating new low-risk products is so cumbersome, it discourages new products... The FDA may deny smokers access to new products that may save their lives." "Siegel was equally critical of the law, calling it "an absolutely absurd approach to the tobacco problem" that sets a "terrible precedent." "It puts the FDA into the business of approving deadly products. I think it really undermines the entire federal system of health regulation. They are approving products that are killing people," he said. Siegel argued that the legislation puts the FDA in the position of "deceiving consumers" by putting its stamp of approval on products that the agency may deem as "safer cigarettes" because they have reduced levels of carcinogens." "There's no connection necessarily between levels of carcinogens and safety of the product," Siegel said, explaining that tobacco smoke contains more than 10,000 chemicals, only a fraction of which have been identified." "Is there a safer cigarette?" he asked. "No, not in terms of what FDA can do -- tinkering with ingredients. We don’t know if those changes will result in a reduction in disease. We don’t have biomarkers for disease risk. We don’t have scientific knowledge to know if we have produced a safer cigarette. We don’t have that science." "Siegel argued that the FDA's recent warnings about the possible dangers of e-cigarettes -- battery-powered devices that provide tobacco-less doses of nicotine in a vaporized solution -- were troubling, given that such devices are sure to be proven safer than actual cigarettes. Holding up an e-cigarette loaded with a glycerine cartridge, he said, "If we put in a nicotine cartridge, is it 'safe'? Probably not. But is it safer [than tobacco-containing cigarettes]? Yes." "He said he worried that it would take years for the FDA to evaluate and approve e-cigarettes for sale, when they have been shown to be an effective quit-smoking product." According to a Zogby poll, 65% of those who have an opinion about whether electronic cigarettes should remain available to people trying to quit smoking believe that these products should remain on the market. While 28% of adults had no opinion or were not sure, 47% answered "yes" and only 25% answered "no" to the question: "Do you think electronic cigarettes should be an option available to people trying to quit smoking, similar to the patches, gum, and lozenges currently on the market?" According to Zogby International: "A strong majority of Americans want to see electronic cigarettes regulated by the U.S. Food and Drug Administration (59%), but nearly half (47%) say the smokeless devices should be an option available to people trying to quit smoking, similar to patches, gum and lozenges currently on the market, and that number increases to 57% among those who have heard about ecigarettes prior to taking the poll. ... In the hunt for a safer cigarette, electronic cigarettes, often referred to as e-cigarettes, are becoming a popular option among those either trying to quit or who are looking to replace standard tobacco smokes with an alternative that manufacturers claim to be safer. Ecigarettes vaporize a solution often containing nicotine, but there is no smoke, just odorless water vapor, and produce almost no dangerous carcinogens." To me, the most important finding is that among those who have heard of electronic cigarettes, 57% believe they should remain on the market as an option for smokers who may wish to try to quit. What is sad is that the overwhelming majority of anti-smoking groups do not want these devices to remain on the market to help smokers quit. Such a policy would result in perhaps hundreds of thousands of ex-smokers returning to cigarette smoking, which would have tragic consequences in terms of disease and death. It's nice to see that the American public has more good sense than these anti-smoking groups. New Study Finds Nicotine Gum May Pose Carcinogen Hazard to NRT Users; Will Anti-Smoking Groups Call for Removal of Oral NRT Products from Market? A new study published online ahead of print in the journal Cancer Research reports that the use of nicotine gum is associated with significant exposure to a potent carcinogen and concludes that oral nicotine replacement therapy (NRT) use therefore poses a potential carcinogenic hazard to some users. The same problem was not detected with the nicotine patch. Since the study concludes that the carcinogens were likely formed in the stomach, the problem would also not be expected to occur with the use of nicotine inhalers or electronic cigarettes. In the study, urine levels of NNN - a potent carcinogen - were measured at baseline in smokers. Then, the smokers quit smoking by using either nicotine patches, nicotine gum, or nicotine lozenges. The group was followed for a period of two months after quitting smoking, with periodic follow-up measurements of NNN in their urine. "In 13 of 34 nicotine gum or lozenge users from both studies, total NNN at one or more time points after biochemically confirmed smoking cessation was comparable to, or considerably higher than, the baseline levels. For most of the subjects who used the nicotine patch as a smoking cessation aid, urinary total NNN at all post–quit time points was <37% of their mean baseline levels." Of note, experts estimate that 36.6% of nicotine gum users are long-term users. Thus, these concerns are not just hypothetical ones. Because the authors suggest that the NNN is being formed endogenously in the stomach in association with oral NRT use (this would explain the absence of this NNN problem in nicotine patch users), one would surmise that nicotine inhalers and electronic cigarettes do not pose similar problems of significant carcinogenic exposure to users due to the endogenous formation of NNN. Given this finding that oral NRT users may experience significant carcinogenic exposure and that this exposure could persist over long periods of time due to the way these products are commonly used, the question is: Why aren't the same anti-smoking groups which are calling for the removal of e-cigarettes from the market also calling for the removal of oral NRT products? How can the Campaign for Tobacco-Free Kids, the American Heart Association, the American Lung Association, Action on Smoking and Health, and the American Legacy Foundation justify their calls for a ban on electronic cigarettes - which have not been shown to pose any carcinogenic hazard - while they remain silent about the risks of oral NRT use - which has now been shown to pose a significant carcinogenic hazard in a substantial proportion of users? Clearly, there is a need for more research on these products, as suggested by the study authors. But why allow the product to remain on the market while these studies are conducted? If your attitude is that e-cigarettes must be taken off the market until further studies are conducted, then why should oral NRT products remain on the market during those same studies? Let me make a clear distinction, however, between oral NRT products and electronic cigarettes. In the first case, there is clear evidence of a significant carcinogenic exposure that could potentially put users at risk, especially the 36.6% who use the product long-term. In the second case, there is not any evidence of a carcinogenic hazard, or any other hazard for that matter (other than the effects of nicotine itself, which is the same in all of these products). For the anti-smoking groups that are calling for a ban on electronic cigarettes, I pose the following challenge: please identify one specific chemical exposure which is likely causing significant harmful effects in vapers. For the anti-smoking groups that are calling for a ban on electronic cigarettes in public places, I pose a similar challenge: please identify one specific chemical exposure which is likely causing significant harmful effects in non-vapers. It is all well and good to say: "We don't know if these products are safe. We should ban them until we know they are safe." But that's an uninformed opinion. There is plenty of scientific evidence out there already about the safety of the product. It has been studied extensively in the laboratory and its chemical components have been characterized. In fact, we know far more about the chemical components of electronic cigarettes than we do about the components of Marlboros. Policy needs to be based on science, not pure conjecture. Let's look at the science. Based on the studies that have been done and the information about adverse effects of the product during its 3 years of use in the United States, as well as the characterization of the components in the product, what are the specific chemical exposures occurring among vapers and non-vapers that these anti-smoking groups posit may pose a significant health hazard? If these groups cannot name a potential specific hazard, then it seems imprudent to ban the product, take it off the market, or even to ban its use in public, as this is going to result in forcing large numbers of vapers to go back to cigarette smoking. You see, the anti-smoking groups have it all wrong. They are arguing that we need to ban the product because it is possible that it could be having an adverse effect on users (or non-users) and so to be safe and make sure that we are not causing harm, we need to carry out more studies (of course, they have not specified what studies are needed, since we already have 3 years of use of the product with no reported adverse effects). Instead, I argue that to remove the product from the market, or even to ban its use in public, would result in a known and definite public health hazard: thousands of vapers returning to cigarette smoking, which is without doubt going to cause disease and death. Public health is about reducing disease and death, not increasing it because of scientific uncertainty. Scientific uncertaintly is always going to be present to some degree. We cannot let that uncertainty get in the way of making rational decisions and we certainly cannot allow it to make us forget the information that we do have. And the information that we do have clearly suggests that pulling e-cigarettes off the market would do a lot more harm than good. My analysis, of course, is subject to reconsideration. If any of the anti-smoking groups can present a specific chemical exposure that could likely be causing significant harm in vapers or non-vapers (other than the nicotine, which is of course present in all NRT products), then I will reconsider my position. But based on the current evidence available, it is very clear to me that allowing ex-smokers to continue using electronic cigarettes, even in public places, is in the best interests of the public's health. Forcing them to return to cigarette smoking is the last thing in the world that public health groups should be doing. An enlightening article by Dr. Simon Chapman in the current issue of Tobacco Control presents the surprising news that Japan Tobacco is supporting strict and aggressive street smoking bans (see: Chapman S. Japanese street smoking bans: a Japan Tobacco foil to prevent clean indoor air policy? Tobacco Control 2009; 18:419). At first blush, it might seem shocking that a tobacco company would support such draconian smoking bans. But on closer examination, it turns out that the tobacco industry's support for these measures in Japan is actually a foil as Chapman calls it - an attempt to re-frame the issue so that attention is diverted from efforts to ban smoking indoors: in workplaces, including bars and restaurants. As the article explains: "Senior Japan Tobacco representatives have been enthusiastic supporters of the street smoking bans, while maintaining staunch opposition to indoor smoking bans. Dr Yumiko Mochizuki of Japan’s National Cancer Centre suggests that the industry’s intense support of the policy may suggest it sees street bans as an important foil to hold off indoor bans. Because of the smaller number of cumulative "smoking hours" available, the number of cigarettes forgone because of street smoking bans would be incomparably smaller than would be caused by indoor workplace bans, including those in bars and restaurants. By supporting street bans, Japan Tobacco would calculate that it could ride the popular wave of Japanese anti-litter sentiment, basking in civic-minded corporate social responsibility. In doing so, it helps contribute to the continuing framing of public smoking as an issue of manners and consideration, cleanliness and safety, while its role in chronic disease is sidelined. Mochizuki argues that the Japanese model may well be being promoted as the way to go elsewhere in the often crowded cities of Asia." This story should give anti-tobacco advocates in the U.S. some pause. I have argued that the ever-increasingly aggressive attempts to ban smoking almost everywhere - including the wide-open outdoors - is going to harm our efforts to ban smoking in workplaces where people actually need the protection. For one thing, it diverts attention from chronic exposure to secondhand smoke and puts the sole focus on acute, even fleeting exposures. Second, it casts us as anti-smoking zealots who are trying to eliminate all public smoking. Third, it takes us away from a strong scientific base. Fourth, it risks losing our credibility by asking the public to accept increasingly hysterical claims. When you see tobacco companies starting to support a policy, you had better seriously re-examine your support for those policies. If the tobacco industry truly felt that street smoking bans would enhance the overall goal of protecting people from secondhand smoke, it would certainly not support these measures. Perhaps the industry is banking on a backlash and/or on a diversion of attention. My own prediction is that the movement's new obsession with trying to extend smoking bans to the outdoors, including parks, streets, and sidewalks is going to backfire by diverting attention away from the need for bans on smoking in the workplace and from the effort to extend protection to all workers in bars, restaurants, and casinos. That's where our attention should be -- not on trying to protect fleeting exposure from any whiff of smoke in a public park, street, or sidewalk. Dr. Chapman's commentary helps to elucidate why my op-ed in the New York Daily News was so important. Exaggerated health claims and the support of draconian policies that are not based on scientific evidence are hurting, not helping the smoke-free cause. National data from all hospital admissions in Australia show no apparent effect of smoking bans that were enacted in the various Australian states between 2005 and 2007. The data are easily available online and Christopher Snowdon over at Velvet Glove, Iron Fist has produced graphs of long-term trends in heart attack admissions in Australia before and after these smoking bans. He provides analyses of both the national trend in heart attack admissions and in the state-specific heart attack trends, showing with an arrow the point at which the smoking ban became active in each of the states. There is no apparent effect of the smoking ban on heart attack admissions in any of the states. The most important pieces of data are those for New South Wales and Victoria, because they contain the largest populations. In both, there was no apparent effect of the smoking ban on heart attacks. If anything, there was an increase in heart attacks associated with the first nine months of implementation of the smoking bans in those states. As Snowdon notes: "Note that the Helena hypothesis specifically claimed a drop in heart attacks of 40% within the first six months of the ban. Although Victoria and New South Wales introduced their bans towards the end of the time-frame, there was still nine months between July 2007 and March 2008 for a drop in heart attacks to occur. Instead, the rate rose from 51,667 to 55,676 between 2006/07 and 2007/08." These results are in accordance with the observations of several tobacco researchers in Australia who have previously told me that they failed to see any significant effect of smoking bans there on heart attack trends. Today's story adds to the list of states and countries for which national or state-specific data show no effect of the smoking ban, bringing the total up to 10. The strength of these data is that the entire country or state is included (there is no sampling), there is little concern about heart attack cases that may have presented to out-of-town hospitals, and the populations involved are quite large, helping to protect against random fluctuations in the data which could present the false appearance of a large increase or decrease in heart attacks from one year to the next. As Snowdon writes, reflecting a similar sentiment about the importance of these population-based, large studies of national or state-specific data: "It would, however, be nice to think that journalists might ask themselves whether data collected by professional tobacco control advocates from obscure towns really trumps genuine hospital admissions data collected by professional statisticians from entire nations." The fact that the largest declines in heart attacks in the published studies occurred in the smallest of communities and that data for every state or country studied so far fails to confirm any significant short-term effect of smoking bans on heart attacks argues against the validity of the conclusion reached by the Institute of Medicine (IOM) committee, which failed to examine the readily available heart attack admissions data from any of these 10 states and/or countries. It is quite clear that the IOM report failed to provide any review of these unpublished data. Nevertheless, the committee claimed that it had comprehensively reviewed the unpublished data: the press release states: "The IOM committee conducted a comprehensive review of published and unpublished data and testimony on the relationship between secondhand smoke and short-term and long-term heart problems." In my opinion, the premature rush to judgment by anti-smoking researchers and groups on the issue of smoking bans and heart attacks undermines both the scientific integrity and the scientific credibility of the tobacco control movement. While the conclusions of anti-smoking groups about the smoking ban and heart attack studies is receiving widespread publicity, so is the criticism of these groups' unsupported pronouncements. For example, an op-ed in Sunday's New York Post by Jacob Sullum -- a senior editor of Reason Magazine -- calls the IOM committee out for its sloppy and biased review of the data. "when people stop smoking, their heart-attack risk declines gradually over several years, and it's hard to see why the risk would fall any faster for people exposed to secondhand smoke. Furthermore, estimates from the CDC and the American Heart Association indicate that smoking and secondhand smoke together account for about 25 percent of heart-disease deaths. So how could a smoking ban, even one that eliminated all smoking, cut heart attacks by 40 percent (or 47 percent, as another study claimed)? The IOM panelists dodge these issues by declining to estimate the size or the timing of the impact from smoking bans, citing the limitations of the studies and the wide variations between them. But "if you can't even estimate the magnitude of an effect," notes Michael Siegel, a Boston University public-health professor who was one of the report's reviewers, "you are hardly in a position to conclude that [it] exceeds random variation combined with the known secular decline in heart-attack rates." ... Siegel, who faults the IOM committee's "sensationalistic" approach, is a longtime backer of smoking bans who nevertheless tries to separate his political advocacy from his scientific analysis. It's too bad the authors of the IOM report, who immediately used it as an excuse to demand strict smoking regulations throughout the country, did not follow his example." It pains me to see the scientific integrity of the tobacco control movement imploding like this. While I support the same goal of protecting the public from secondhand smoke exposure (though not the agenda of spreading smoking bans to the wide-open outdoors), I think the scientific credibility of public health groups is our most prized possession. To squander that in an attempt to promote even a valuable public health policy is foolish. But more importantly, misrepresenting the scientific evidence to the public is, I believe, unethical. It is inconsistent with the ethical code of conduct of public health. Over at Reason Magazine's Hit & Run blog, Jacob Sullum has criticized the Institute of Medicine (IOM) report on smoking bans and heart attacks for failing to consider relevant data and for reaching a pre-determined conclusion. In a post which he wittily but aptly entitles "Myocardial Infractions," Sullum describes how the IOM report not only failed to consider unpublished data which did not support the report's conclusion, but also drew conclusions that were inconsistent with the assertions made in the report itself. While I had previously criticized the report for failing to consider unpublished, but relevant and significant data from Scotland, England, and Wales, Sullum points out that there are additional data from California, New York, Florida, Oregon, and the United States as a whole that were not considered and which do not support the report's conclusion that smoking bans result in substantial, short-term declines in heart attacks. Sullum writes: "a closer look at the IOM report, which was commissioned by the U.S. Centers for Disease Control and Prevention, suggests its conclusions are based on a desire to promote smoking bans rather than a dispassionate examination of the evidence. Thousands of jurisdictions around the world restrict smoking. Some of them are bound to see significant drops in heart attacks purely by chance, while others will see no real change or significant increases. Focusing on the first group proves nothing unless it is noticeably bigger than the other two groups. The largest study of this issue, which used nationwide data instead of looking at cherry-picked communities, concluded that smoking bans in the U.S. "are not associated with statistically significant short-term declines in mortality or hospital admissions for myocardial infarction." It also found that "large short-term increases in myocardial infarction incidence following a workplace ban are as common as the large decreases reported in the published literature." That study, published by the National Bureau of Economic Research (NBER) in March, suggests that publication bias—the tendency to report positive findings and ignore negative ones—explains the "consistent" results highlighted by the IOM committee. But even though the panelists say they tried to compensate for publication bias by looking for relevant data that did not appear in medical journals, they ignored the NBER paper, along with analyses that found no declines in heart attacks following smoking bans in California, Florida, New York, Oregon, England, Wales, Scotland, and Denmark." Sullum also points out that although the report emphasized that few (only two) of the studies actually looked separately at heart attacks among smokers and nonsmokers, it nevertheless concludes that smoking bans specifically reduce heart attacks among nonsmokers by reducing acute secondhand smoke exposure. As Sullum writes: "If smoking bans reduce heart attacks, the effect could be due to declines in smoking, declines in secondhand smoke exposure, or both. The IOM report settles on that last explanation, quite a leap given that 'only two of the studies distinguished between reductions in heart attacks suffered by smokers versus nonsmokers.'" Sullum concludes: "Siegel, who faults the IOM committee’s "sensationalistic" approach, is a longtime supporter of smoking bans who nevertheless tries to separate his political advocacy from his scientific analysis. It’s too bad the authors of the IOM report, who immediately used it as an excuse to demand strict smoking regulations throughout the country, did not follow his example." Why not just tell the truth and state that you examined only published data, not unpublished data? Why is it that tobacco control groups seem to have so much trouble these days simply telling the truth? The rest of the story is that the IOM report failed to consider important, significant, and relevant unpublished data from nine different states or countries which do not support the conclusion of a significant short-term reduction in heart attacks from smoking bans. This has resulted in a severe bias in the report because of the presence of publication bias: clearly, only the positive studies are being published. This throws the report's conclusions into serious doubt. But the other aspect to the rest of the story is that rather than simply acknowledge that they failed to examine unpublished data, the committee has essentially lied to the public by claiming that it conducted a comprehensive review of the unpublished data. Bias is one thing, but dishonesty is quite another. Last week, an Institute of Medicine (IOM) committee released a report whose major conclusion was that smoking bans have a significant short-term effect on heart attacks, reducing the incidence of acute coronary event admissions to hospitals due in part to reduced secondhand smoke exposure. The press release headline read: "Smoking bans reduce the risk of heart attacks associated with secondhand smoke." Although the report's conclusions have received widespread publicity, a little-noticed but severe flaw in the basic epidemiology/biostatistics foundation of the report renders its conclusion invalid. In this commentary, I attempt to explain the nature of this flaw and why it renders the report's conclusion invalid. The report was very clear in asserting that the committee could draw no conclusion about the magnitude of the effect of smoking bans in reducing heart attack admissions. In fact, the report made it clear that the committee had no confidence in even estimating the magnitude of this effect. According to the report: "However, because of the weaknesses discussed above and the variability among the studies, the committee has little confidence in the magnitude of the effects and, therefore, thought it inappropriate to attempt to estimate an effect size from such disparate designs and measures." In other words, what the committee is saying is they have no confidence in making any estimate of the size of an effect of smoking bans on heart attack rates. In epidemiology/biostatistics, we call this the "point estimate." The point estimate is the estimate of the magnitude of a particular association or effect. In other words, what is the estimate of the percentage by which smoking bans reduce heart attacks? Is it 4%, 10%, 20%, 47%? The report makes it clear that we have no idea and that the studies are plagued with weaknesses such that there is no confidence in even making an estimate of the effect of smoking bans on heart attacks. Note that I am not drawing my own conclusion about the quality of the studies. I am merely repeating what the report itself concludes. Now, despite failing to be able to even guess what the point estimate might be, the report nevertheless clearly concludes that smoking bans cause a significant decrease in heart attacks. What this means is that the committee is certain that the 95% confidence interval around the point estimate for the effect of smoking bans does not include zero. Suppose that the point estimate was 20%. Can one conclude that the effect on heart attacks is significant? It depends on the variability of the point estimate, which we can indicate through a confidence interval. With 95% certainty, what range are we sure that the actual point estimate falls into? Suppose that the 95% confidence interval goes from 15% to 25%. Then, while we're not exactly sure whether the true effect is 15%, 20%, or 25%, we are sure that the effect is no lower than 15%, and we certainly know that it is greater than 0%. In other words, we can conclude that there is a significant effect of smoking bans on heart attacks. In contrast, suppose that the 95% confidence interval goes from -5% to 50%. While we think the best estimate of the effect is a reduction of 20%, it could be anywhere between an increase of 5% and a reduction of 50%. The confidence interval includes zero (0%), meaning that we cannot conclude that there is a significant effect of smoking bans on heart attacks, because it is possible that the true effect is zero. I hope readers see that in order to conclude that there is a significant effect of smoking bans in reducing heart attacks, one would have to derive a confidence interval and that confidence interval could not include zero. Another way of saying this is that the "lower bound" of the confidence interval would have to be greater than zero. In essence, what the IOM report is concluding is that we have no idea what the point estimate for the reduction of heart attacks by smoking bans is, but we are nevertheless sure that the lower bound of the confidence interval around that point estimate does not go down as far as zero. But there's two problems here. First, you can't estimate the confidence interval unless you make some guess about the variability around the point estimate of the purported effect. If you haven't estimated a confidence interval, then you can't possibly conclude that the confidence interval doesn't include zero. Second, if you can't even take a guess at a point estimate, then even if you know the variability around that estimate, you can't figure out the lower bound of the confidence interval, because you don't know where to start counting down from. In other words, if you are not able to make a point estimate, then you have no way of knowing what the lower bound of the confidence interval is. Do you see that the IOM report's conclusion is based on a complete leap of faith? What the report is saying is that we have no idea what the lower bound of the confidence interval is; however, we are nevertheless certain that it does not extend down as far as zero. This is equivalent to drawing a pre-determined conclusion. If you are not willing to actually see what the true confidence interval is before drawing a causal conclusion, then you might as well just draw your conclusion prior to doing the actual review. It is a leap of faith, because it is accepting something without empirical evidence. The committee provides no evidence about what the lower bound of the confidence interval is and it makes no attempt to estimate either a point estimate or a lower bound of the confidence interval around that estimate. Nevertheless, despite the complete absence of any empirical evidence of what that lower bound is, they are quite certain that the lower bound is greater than zero. Note that I am not, in this commentary, even getting into the issue of how the failure to consider unpublished, but highly reliable, meaningful, relevant, and population-representative data from Scotland, England, Wales, Denmark, and the United States as a whole would lead to a biased point estimate. I am just noting that even taking the report's conclusions as a given, its ultimate conclusion is not supported and appears to be a leap of faith rather than a serious attempt to use the evidence to derive a lower bound for the confidence interval of any possible effect. Finally, I have to say that if one of my students handed in a paper which did an epidemiologic analysis of a potential causal relationship and concluded in the paper that it was impossible to even make a guess as to the point estimate of the purported effect, I would hope that the student would not conclude the paper by stating: "While we have no idea what the point estimate is or the variability around that point estimate, I conclude nevertheless that the confidence interval must not cross zero." I suspect I would give the student a failing grade on the paper. Just to be clear, I would love to be able to take a leap of faith and conclude that all of my efforts over the past 24 years have resulted in policies that produced dramatic declines in heart attacks within one to two years. But as scientists, our role is not to take leaps of faith. It is to consider the empirical evidence and base our conclusions on that scientific evidence. It is not the IOM committee's fault that the underlying studies are frought with severe weaknesses, that only a few of them employed comparison groups, and that the existing evidence is simply not sufficient to even guess as to the point estimate for a purported effect. But you aren't required to draw a causal conclusion from weak data. You could also come out and say: "The evidence is suggestive of an effect, but we simply don't have enough evidence to draw a definitive causal conclusion at this point. We just can't rule out the possibility that random variation in heart attacks, especially in small communities, and the existing secular trend of decreasing heart attacks due to substantial advances in medical treatment for heart disease during the time period of these studies are a plausible alternative explanation for the observed declines in heart attack rates in these studies." Instead, it appears that the report felt it necessary to draw a definitive causal conclusion, even in the absence of what is essentially its own admission that there is insufficient evidence to draw such a conclusion. Today, I reveal that another element of bias in the Institute of Medicine's report on the effect of smoking bans and heart attacks occurred in the proceedings that the Committee undertook in reviewing the relevant data. The Committee held a public meeting in which it heard presentations by experts in the field covering various topics. According to the report, the topic of smoking bans was only presented by one expert: Dr. Stan Glantz. Dr. Glantz has a very particular view of the smoking ban studies. I have no problem with the Committee choosing to ask him to present his side of the issue. However, to achieve balance and entertain alternative hypotheses, the Committee should also have invited someone to present the other side of the issue. If you only hear one side of the issue, then of course you are going to get a biased picture of the data out there. This could easily result in bias in the Committee's analysis and report. It doesn't appear to me that there was a serious effort to elicit both sides of this scientific question because the Committee was only presented with one side of the picture. How could that not result in a biased analysis? I hate to use the term, but it appears that the deck was stacked. None of the experts asked to address and provide background materials to the Committee had taken the position that the scientific evidence is not sufficient to conclude that smoking bans result in dramatic, immediate reductions in heart attacks. Thus, it is perhaps not surprising that the Committee failed to consider the multitude of data that refutes its ultimate conclusion. For example, had I been asked to address the Committee, they would have had in hand all the relevant data from England, Scotland, Denmark, and Wales which showed no effect of the smoking bans in those countries on admissions for acute coronary events. At least they would have had the data in hand and could have considered it as part of its review. These data could also have been provided by any number of other experts in the field. But if you only review data that support a conclusion, you're going to end up drawing that conclusion, regardless of its validity. The rest of the story is that not only is the report of the IOM committee on smoking bans and heart attacks biased, but the process that led to this report appears to be significantly biased as well. Data from a government study of the effects of the smoking ban in Denmark show no apparent impact of that smoking ban on heart attack hospital admission rates. The study analyzed rates of hospitalization for heart attacks in all hospitals in Denmark for a period of five years prior to the smoking ban (implemented in August 2007) and 18 months after implementation of the ban. A statistical model controlled for age, month, and secular trends in heart attack rates. No effect of the smoking ban was detected for either 35-64 year-old males, 35-64 year-old females, 65-84 year-old males, or 65-84 year-old females. The trends in heart attacks among one of these four groups - men ages 35-64 -- is shown in Figure 6 of the report. As can be seen, there is a clear trend of decreasing heart attack rates over time. Seasonal variation in heart attacks is also clear. There is no apparent effect of the smoking ban on the trend in heart attacks. According to the report, the graphs for each of the other three demographic groups are similar, with no apparent effect of the smoking ban on heart attacks in any of the four study groups. An advantage of this study is that Denmark has an excellent national registry of heart attack admissions. In addition, the report notes that there were few changes in treatment of heart disease in the country during the period surrounding the implementation of the smoking ban. This is now the fourth country for which data show no short-term effect of the smoking ban on admissions for acute coronary events. The others are England, Scotland, and Wales. None of these findings were included in the Institute of Medicine report which concluded that smoking bans cause an immediate and substantial decline in heart attacks. An important observation is that the few studies which found large effects of the smoking bans were in very small communities. None of the studies that covered larger populations -- states or countries -- found large effects and many of these studies found no effect. This suggests that the findings from isolated communities - like Helena and Pueblo - are merely random phenomena. The fact that these results cannot be confirmed in any population-based study is concerning. This pattern of findings also confirms that there is a severe publication bias present. We now have data from four countries showing no short-term effects of the smoking ban on acute cardiovascular events, yet none of these studies have been published. Researchers have a hard time getting excited about negative results and so they are much less likely to decide to publish such data. In contrast, when they find an effect, they are excited about publishing the findings. This is clearly what is going on with these smoking ban and heart attack studies. (Thanks to Klaus K. for kindly providing the English translation of this report). I have analyzed the data which the Institute of Medicine included and failed to include in its report and today, I reveal that the report failed to consider data from three countries (England, Scotland, and Wales) which seem to clearly show that the smoking bans in these countries had no significant short-term effect on acute coronary events. These data are all national data which include all hospital admissions at all hospitals in these countries. Thus, they represent a better source of data than what was used in some of the published studies (which only included a sample of hospitals). Moreover, they cover large populations, with a sample size greater than that of all other studies combined. Thus, the data from these countries are critically important an carries much weight in the overall analysis. 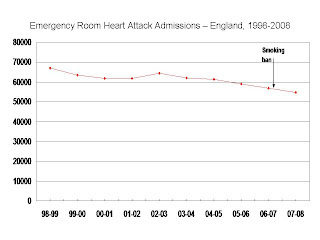 National data from the National Health Service show that England's smoking ban had no effect on the trend in the number of heart attack admissions during the first nine months that the ban was in effect. The National Health Service has reported annual summaries of the total number of emergency room admissions for heart attacks or for admissions in which the patient subsequently suffered a heart attack. These data cover all hospitals in England; thus, there are no gaps in the data. The data cover the fiscal year, starting April 1 of the first calendar year and ending March 30 of the second calendar year. Thus, the 2007-2008 data cover the period from April 1, 2007 through March 30, 2008. The smoking ban in England took effect on July 1, 2007. Thus, although the 2007-2008 data contain figures for three months during which the ban was not yet in effect (April, May, and June), if the ban had any dramatic effect on heart attacks (such as a 27% which is the figure which anti-smoking researchers are citing), one would expect to see some significant acceleration of the existing secular decline in heart attack admissions during the reported 2007-2008 period. However, there was only a 2% decline in heart attack admissions in England from 2006-07 to 2007-08, compared to a 2.8% decline in the preceding year and a 3.8% decline in the year preceding that. Thus, these data show no evidence that the smoking ban resulted in any significant, immediate decline in heart attacks. Also, these data are very important, because the sample size is huge. Unlike the small sample sizes in studies from Helena, Pueblo, and Bowling Green, the sample size in this England study is larger than all of the published studies combined. In addition, the study covers a long period of time, not just the year before and after the smoking ban (as is the case with some of the published studies). The data above include all hospital discharges with a diagnosis of heart attack, both those in which the heart attack was the presenting reason for admission and those cases in which the patient suffered a heart attack subsequent to admission. While there is nothing wrong with this, someone could argue that it is only the admissions for a presenting heart attack that are relevant, because presumably, subsequent heart attacks experienced in the hospital are not triggered by secondhand smoke exposure. The decline in heart attack admissions from 2006-2007 to 2007-2008 was 3.7%, compared to declines of 3.7% in the preceding year and 3.8% in the year before that. Data from the Scottish national health service, which cover all of Scotland, reveal that while there was a decline in acute coronary event admissions (heart attacks plus angina) in the first year after the smoking ban, the admission rate increased during the second year back to baseline levels. Thus, there does not appear to be any evidence that the smoking ban in Scotland, implemented in April 2006, led to a decrease in coronary event admissions. National data from Wales reveal that there was no reduction in hospital admissions for myocardial infarction (heart attacks) during the first 9 months after implementation of the smoking ban throughout Wales. Monthly data on heart attack admissions from all Welsh hospitals for the years 2006 and 2007 were examined. The smoking ban went into effect on April 2, 2007. There were 4,199 heart attack admissions in 2006 and 4,155 in 2007. Thus, there was essentially no change in heart attacks between these two years. In contrast, there was a 6.3% decline in heart attack admissions from 2005 to 2006 and a 10.3% decline in admissions from 2004 to 2005. When analyzing the data by month and comparing 2007 to 2006, there was an increase in heart attack admissions during the first five months after the smoking ban (April through August) and a decline in heart attack admissions during the next four months (September through December). It seems quite clear that the data show that the smoking ban in Wales was not associated with a decline in heart attack admissions during the first 9 months it was in effect (and if anything, the decline in heart attacks came to a halt). The reasons why the report failed to consider these national data are not clear. However, what is clear is that these data were not presented and reviewed in the report. For this reason, I believe that the conclusions of the report are severely biased. You cannot possibly come to an unbiased conclusion about the effects of smoking bans on heart attacks if you only consider data which support the contention that these bans are having a strong effect. Obviously, if you exclude data which are counter to your conclusion, you are going to bias your analysis. It appears this is exactly what happened here. Remember that a meta-analysis or review of data is only as good as its success in reviewing all relevant data that are available. If you only include data that support your position, you are going to end up with a biased conclusion. By the way, the data for England and Scotland are readily available online and I believe that the committee was made aware of the existence of these data. The rest of the story is that the report is biased because it fails to include very relevant data from England, Scotland, and Wales which show no evidence that the smoking bans in those countries caused significant short-term reductions in acute coronary event hospital admissions. Because of the size of the populations covered by these data, including them in the overall review would have negated the overall conclusion of the report. The link is here. I am quoted as pointing out that the report concludes that anyone exposed briefly to secondhand smoke could suffer a heart attack, while the truth is that this risk only is significant for people with severe pre-existing heart disease. I also challenge the validity of the report's conclusion on the effect of smoking bans, given that the report itself argues that it has no confidence in even estimating the magnitude of effect (and also that the individual studies were severely flawed and the committee failed to review data which showed no effect of smoking bans on heart attacks in three different countries). Here is a link to the New York ABC News story on the Institute of Medicine report on smoking bans and heart attacks. After clicking on the link, you need to click on "VIDEO: Impact of Smoking Bans." The story includes a brief comment from me regarding the lack of sufficient evidence to conclude that the observed declines in heart attacks in the studies reviewed by the committee are attributable to the smoking bans. Remember, however, that the committee only reviewed studies which found evidence to support its conclusion. The committee apparently did not review any of the data which showed that there was no effect of smoking bans, including data from England, Scotland, and Wales. A major reason why I view the report as being biased is specifically because of its failure to consider all of the data. If you only consider data in support of a given conclusion, you are going to end up with a systematically biased review. A new report from the Institute of Medicine's Committee on Secondhand Smoke Exposure and Acute Coronary Events, entitled "Secondhand Smoke and Cardiovascular Effects: Making Sense of the Evidence," concludes that smoking bans result in a nearly immediate and significant decrease in heart attacks, not only among smokers but among nonsmokers as well. The committee also concluded that brief exposure to secondhand smoke causes heart attacks and refused to qualify its conclusion by noting that such an effect is substantial only in those with severe existing heart disease. According to the press release: "Smoking bans are effective at reducing the risk of heart attacks and heart disease associated with exposure to secondhand smoke, says a new report from the Institute of Medicine. ... 'It's clear that smoking bans work,' said Lynn Goldman, professor of environmental health sciences, Johns Hopkins Bloomberg School of Public Health, Baltimore, and chair of the committee of experts that wrote the report. 'Bans reduce the risks of heart attack in nonsmokers as well as smokers.'" Unfortunately, this report might just as well have been called: "Secondhand Smoke and Cardiovascular Effects: Making Nonsense of the Evidence." First, the conclusions of the report are completely defied by the committee's own assertions that are presented in the actual report. Second, the report draws conclusions that are essentially meaningless from an epidemiologic and clinical perspective. What the report does is take important questions and distort them so much that the answers no longer have any meaning. Let me address each of these problems in turn. To see what I mean about the conclusions of the report not being consistent with the report itself, consider first what the report concludes about the ability, based on the existing evidence, to estimate the magnitude of the effect of smoking bans on heart attack rates. The report asserts as follows: "The committee was unable to determine the magnitude of effect on the basis of the 11 studies, because of variability among and uncertainties within them. Characteristics of smoking bans vary greatly among the locations studied and must be taken into account in reviewing results of epidemiologic studies. Those characteristics include the venues covered by the bans (such as offices, other workplaces, restaurants, and bars) and compliance with and enforcement of the bans. Other differences or potential differences among the studies include the length of followup after implementation, population characteristics (such as underlying rates of acute coronary events and prevalence of other risk factors for acute coronary events, including diabetes and obesity) and size, secondhand-smoke exposure levels before and after implementation, preexisting smoking bans or restrictions, smoking rates, and method of statistical analysis. The time between implementation of a ban and decreases in secondhand smoke and acute cardiovascular events cannot be determined from the studies, because of the variability among the studies and indeed the difficulty of determining the precise time of onset of a ban." The report also asserts: "However, because of the weaknesses discussed above and the variability among the studies, the committee has little confidence in the magnitude of the effects and, therefore, thought it inappropriate to attempt to estimate an effect size from such disparate designs and measures." In other words, what the committee is saying is they have no confidence in making any estimate of the size of an effect of smoking bans on heart attack rates. Another way to say that is this: the committee has no idea of what the effect of smoking bans on heart attacks is. If you can't even estimate the magnitude of an effect - if you have no confidence in even providing an estimate - then you are hardly in a position to conclude that there is a significant effect of smoking bans on heart attacks, an effect which exceeds random variation combined with the known secular decline in heart attack rates. Think about this: we know for a fact that heart attack rates are declining substantially, even in the absence of smoking bans. These declines are in part attributable to improvements in the treatment of coronary disease and also to improved medications, such as the statin drugs which are effective in controlling cholesterol levels. When we see a decline in heart attacks after a smoking ban, we need to determine whether the magnitude of that decline is greater than one would expect in the absence of the smoking ban. In other words, does the observed decline exceed the rate of decline one would expect from the secular changes alone? In order to make such a determination, one needs to quantify the magnitude of the decline in heart attacks. If we can't even estimate, with any confidence, what the magnitude of the decline in heart attacks is, then we are in no position to conclude that we know that the decline is greater than what would have been observed in the absence of the smoking ban. We can't conclude that the observed decline in heart attacks associated with smoking bans has been due to the smoking ban, rather than to the rather drastic declines in heart attacks that have been occurring anyway due to improvements in medical treatment. Epidemiology is all about estimating the magnitude of effects. Simply judging whether an association works in one direction or the other is not particularly meaningful, especially in this situation where we know a priori that smoking bans do not increase heart attacks. Now this is where my 2nd observation comes in. By answering the question: do smoking bans reduce or increase heart attacks, the report is actually making nonsense out of the evidence. Of course smoking bans don't increase heart attacks. The question is: what is the magnitude of the effect. The committee recognizes that the existing studies are so seriously flawed that one has no confidence in being able to judge the effect size. But instead of concluding that the evidence is insufficient, they go ahead and conclude that smoking bans significantly reduce heart attacks anyway. A second example is the press release's conclusion about whether the observed reductions in heart attacks occur in smokers or nonsmokers. The report asserts: "Only two of the studies distinguished between reductions in heart attacks suffered by smokers versus nonsmokers." Later, it emphasizes this point: "In most of the studies, the portion of the effect attributable to decreased smoking by smokers as opposed to decreased exposure of nonsmokers to secondhand smoke cannot be determined." Clearly, this is not sufficient evidence to draw a conclusion about whether the observed reductions in heart attacks are due to reduced active smoking or reduced tobacco smoke exposure among nonsmokers. Nevertheless, the press release states: "Bans reduce the risks of heart attack in nonsmokers as well as smokers." So much for requiring evidence before drawing a conclusion. Perhaps the problems I am discussing are most evident in the report's conclusion regarding the effects of brief secondhand smoke exposure on heart attack risk. Based on the evidence, no one would deny that a brief exposure might trigger a heart attack in a person with severe existing coronary artery disease. But the report goes beyond that in its conclusion. It states that brief secondhand smoke exposure may trigger heart attacks, but without qualifying that statement to make it clear that it refers specifically to people who have coronary disease. Instead, it makes it sound like a healthy person could walk into a smoky bar, sit down for 20 minutes, and keel over from a heart attack. Why is this qualification not added to the study conclusion? I believe it's because the report aims to be more sensationalistic and scare people into thinking that they could drop dead from a heart attack from a brief tobacco smoke exposure, even if they are healthy. But failing to qualify the statement turns the conclusion from being accurate to being inaccurate, from being truthful to being misleading. What it really means is that a political goal, not a purely scientific one, is driving the report's conclusion regarding the acute cardiovascular effects of tobacco smoke exposure. I find this unfortunate because it really taints the scientific integrity of the tobacco control movement. I should probably add that if you read the report carefully, it actually makes the assertion that brief secondhand smoke exposure can appreciably increase the risk of heart attack among healthy people. The report states: "The data provide evidence that it is biologically plausible for secondhand smoke to be a potential causative trigger of acute coronary events. The risk of acute coronary events is likely to be increased if a person has preexisting heart disease." I read this as asserting that brief secondhand smoke exposure triggers heart attacks among people with and without existing heart disease, but that the risk is higher for those with existing heart disease. I do not believe there is any evidence to suggest that such an assertion is true. The report provided no evidence that a healthy person may suffer a heart attack from a mere 20 to 30 minutes of secondhand smoke exposure. There is one other major problem with the report that deserves mention, especially since I think it indicates a bias of the report. The report claims to have reviewed unpublished data and to have attempted to identify unpublished studies that might have found no effect of smoking bans on heart attacks. The report states that "no such studies were identified." I find this difficult to believe, especially since I was a reviewer of the report and I made the committee aware of several unpublished analyses which documented no significant effect of smoking bans on heart attacks. Such studies were conducted in England, Scotland, and Wales. Furthermore, a large but unpublished study of all communities in the United States reported no effect of smoking bans on heart attacks, but this study was ignored by the report. Note that the latter study, the largest of its kind, concluded that: "In contrast with smaller regional studies, we find that workplace bans are not associated with statistically significant short-term declines in mortality or hospital admissions for myocardial infarction or other diseases." It is unfortunate that this study was ignored. I don't see how the review can be considered to be comprehensive if it threw out or ignored all the studies that failed to find an effect, but included, without question, all studies that found an effect, even if these studies failed to include a comparison group which is crucial to being able to infer whether the observed decline in heart attacks was attributable to the smoking ban. Finally, I want to make it very clear that I am not impugning the integrity of the committee or any of its members. I don't think they've done anything wrong. I just think that the report is biased and that subconsciously, there was some sort of pressure operating which led to the report drawing conclusions that were not appropriate given the report's own assertions and review of the evidence. I also think this bias led to the report distorting the questions which it asked and failing to directly answer the questions (rather than distorting them so that the "answer" came out more "favorably"). Action on Smoking and Health - UK (ASH-UK) has become one of the first anti-smoking organizations to support the continued presence of electronic cigarettes on the market. Unlike its U.S. counterpart (ASH-US), which has called for a ban on electronic cigarettes and has gone so far as to threaten electronic cigarette sellers with the prospect of jail sentences, ASH-UK released a statement indicating its support for the use of electronic cigarettes by smokers who are otherwise unable to quit smoking. smoke, are likely to be a safer alternative to smoking. In addition, e-cigarettes reduce secondhand smoke exposure since they do not produce smoke." Thus, while ASH-UK believes that regulation of e-cigarettes is reasonable, the group does not join ASH-US in condemning the product and calling for its immediate removal from the market. Christopher Snowdon has more on ASH UK's position on this issue. This is wonderful news, as it represents one of the first major anti-smoking groups which has come out in support of allowing electronic cigarettes to remain on the market. Unfortunately, our counterparts in the UK appear to have a much more rational attitude than we do in the States regarding whether or not we would prefer to see people die or not. Here, the major anti-smoking groups have expressed their support for a policy (banning e-cigarettes) which would result in disease and death for thousands of people, as ex-smokers would be forced to return to cigarette smoking. I'm gratified to see that ASH-UK has the good sense to support a policy which would save lives, rather than cause illness and death. A close colleague of mine has insinuated to others that my opinions against the prohibition of electronic cigarettes may be motivated by payoffs I am receiving from electronic cigarette companies. The colleague has raised this question to other close colleagues of mine, but importantly, provided absolutely no evidence that I am being funded by electronic cigarette companies. This is an important story, not because of the actual implications for me on a personal level, but because it demonstrates an aspect of the anti-smoking movement's mentality. In the tobacco control movement's view, it is apparently not possible for someone to hold the opinion that electronic cigarettes could be a safer alternative to cigarette smoking and could therefore be saving lives. The mere fact that someone expresses such an opinion immediately raises the specter that the individual is being paid off by electronic cigarette companies. It also demonstrates that many anti-smoking advocates are willing to make personal attacks, accusations, and insinuations -- even against their own colleagues -- without any evidence whatsoever to support these insinuations. The colleague in question has provided not a shred of evidence of my funding by electronic cigarette companies. He has provided no documentation that I have received payments from the electronic cigarette industry and that these payments have influenced my opinions about the issue of the relative safety of vaping versus smoking. This adds to a long and ugly history of unfounded accusations that anti-smoking groups and advocates have made about those who disagree with the dogma of the movement. What is odd here, and perhaps surprising, is that these accusations are being made not against an opponent, but against a tobacco control advocate himself. If you oppose any aspect of the dogma of the movement, you in essence become an enemy, even if you are actually a vehement anti-smoking advocate and a close colleague. This is truly fascinating to me. An interesting article in Youth Today refers to The Rest of the Story as the "watchdog" of the tobacco control movement. The article reviews the financial records of the American Legacy Foundation and some aspects of the Foundation's actions and laments that there has been little oversight of the Foundation's actions. However, it notes that this blog has served as a sort of watchdog for the anti-tobacco movement, pointing out a number of hypocritical actions that the Foundation has taken. "One of the few people who pay close attention to the foundation’s financial operations is Michael Siegel, a professor at the School of Public Health of Boston University. Siegel takes issue with the foundation’s unwavering decision not to give grants to anyone or any public health school that receives tobacco money." "On his blog – “The Rest of the Story: Tobacco News Analysis and Commentary,” at http://www.tobaccoanalysis.blogspot.com – Siegel has taken the foundation to task for partnering with the likes of Time Warner, Conde Nast and Hearst, all of which rely heavily on tobacco advertising and “constantly bombard youth” with tobacco ads, and for funding research to bolster its claims of success against smoking." "Siegel doesn’t have any complaint with most of the research the foundation underwrites, but thinks it is “hypocritical not to give money to institutions that are actively seeking money for tobacco programs” on the grounds that they receive tobacco money, considering the fact that the source of the foundation’s money is the settlement from the tobacco companies." "In one of his postings, Siegel upbraided the foundation for allegedly funding a “front group,” Citizens’ Commission to Protect the Truth, to lobby in a lawsuit for more money for American Legacy’s truth campaign." Ironically, I think that in many ways, The Rest of the Story does serve as sort of a watchdog of the tobacco control movement, playing a role that the tobacco industry deliberately relinquished some time around 2000. It was The Rest of the Story that highlighted the American Legacy Foundation's corporate partnerships with Time Warner, Hearst, and Conde Naste Publications -- all of which are responsible for massive youth exposure to tobacco advertising -- at the same time as the Foundation lamented the problem of youth exposure to tobacco advertising in magazines and in movies. It was The Rest of the Story that revealed the American Legacy Foundation's funding of a front group -- The Citizen's Commission to Protect the Truth -- to support increased funding for the Foundation under the ruse that this was some sort of group of concerned citizens. I should clarify that I did not criticize Legacy for deciding not to give money to organizations that accept tobacco money. I criticized Legacy for the hypocritical action of not giving money to anyone else who takes tobacco money, while at the same time pleading with the tobacco companies to give them more money to run Legacy's campaigns. It is the American Legacy Foundation's hypocrisy over the past few years that The Rest of the Story has brought to the forefront. To be clear, I believe that the "truth" campaign has been effective in reducing youth smoking and I have in fact supported the idea of establishing similar campaigns in all 50 states as well as enhancing funding for the national campaign. In fact, I have argued that wasting all our time and resources on FDA regulation of tobacco has detracted attention from where it really needs to be: finding a way to fund real, state-of-the-art, anti-tobacco media campaigns in all 50 states. But that doesn't mean that the means used to achieve the end of preventing youth smoking should not be subject to scrutiny. The comments section of the Youth Today article gives a brief but interesting insight into the mind of the anti-smoking activist. In these comments, Dr. Michael Cummings of the Roswell Park Cancer Institute calls me a "naysayer" for having the nerve to criticize as what I see as inconsistent, hypocritical, or unethical actions by the Foundation. What he is basically saying is that any criticism of anti-smoking groups is unwarranted and makes you a "naysayer." You must have blind allegiance to the ideology of the movement and if you dare to swerve off the prescribed path, you are a heretic who must be attacked and silenced.